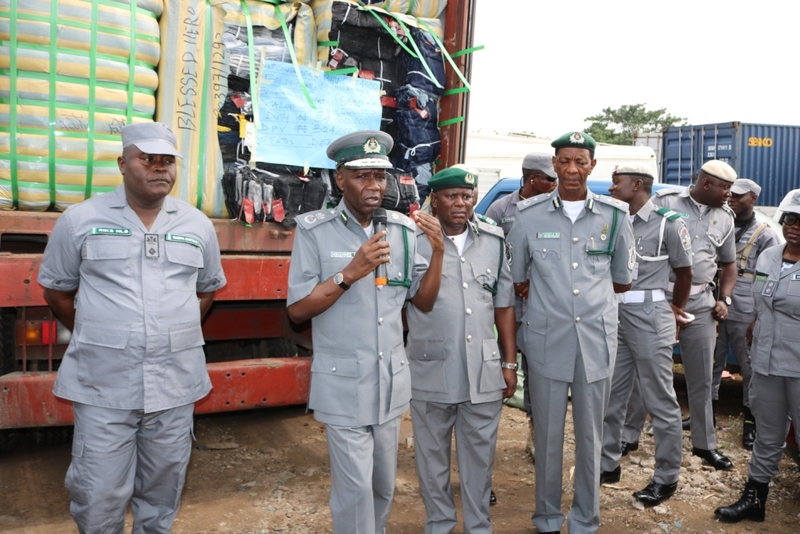 A number of Nigeria Customs Service (NCS) commands across the nation have started releasing their half year performance. Leading the pack is the Federal Operations Unit, Zone ‘A’ Ikeja, Lagos which apart from strengthening its anti-smuggling operations, intercepted various contraband with a duty paid value (DPV) of N8,214,486,072.75 from January-June 2018. A statement signed by the Command’s PRO, Mr. Jerry Attah on Sunday revealed that “the unit through its interventions recovered N405,217,909.00 from duty payments and demand notices on vehicles and general goods that attempted to cut corners from seaports, airport and border stations through wrong classification, transfer of value, and shortchange in duty payment that are meant for the coffers of Federal Government of Nigeria, making a cumulative of N8,619,703,982.00”. Business Hilights also gathered that within the period under review, the Command arrested 107 suspects in connection to 596 different seizures comprising 34,652 foreign parboiled rice (equivalent to 58 trailers); 167 units of exotic vehicles (Toyota Prado/Lexus; bullet proof), Toyota C-HR , Toyota Camry LE, Toyota Prado(s), Toyota Hilux, Ford F150, Pajero Jeeps, Mercedes Benz ranging from 2015-2018 models respectively); 8,987 cartons frozen poultry products, 4,586 jerrycans of vegetable oil, 3,463 cartons of different pharmaceutical/medicaments, 370 parcels/98 sacks of Indian hemp weighing 1,350kg, and various general merchandise. Besides, amongst the star seizures include the interception of 460 sacks of pangolin scales weighing 12, 264 kg and 218 elephant tusks, making it the highest seizure of such endangered species in the history of Federal Operations Unit Zone A. This seizure among others brought a lot of accolades to us from the Comptroller-General of Customs Col. Hameed Ibrahim Ali (Rtd) and his management team. To crown it all was the visit by the Minister of State for Environment; Mallam Ibrahim Usman accompanied by the United Nations charter on CITES delegates led by Mr Juan Carlos who is the Chief Legal Affairs, CITES Headquarters in Geneva, to inspect the seized items and make necessary recommendation to its headquarters. Also, the Minister commended the FOU A for that great seizure. The UN delegates also promised their support to provide necessary trainings towards combatting such illicit trade on endangered species, so that such harmless animals don’t go into extinction. The seized pangolin and elephant tusk alone is valued at N2,739,191,400.00, with two Chinese national as suspects. In his remarks, controller of the Command, Comptroller Mohammed Uba averred that “In order to ensure full implementation of the Government policy banning the importation of rice through land borders, we re-strategized our operational modalities and beam our searchlight at the Creek, Water side, and at various locations in southwest zone and hence the reason for the massive rice seizure within the months under review. We will continue to make sure smugglers within our areas of jurisdiction count their losses until they repent from sabotaging our economy”. According to him, “Even though smuggling is a global phenomenon that cannot be eradicated entirely, all hands must be on deck so that it could be reduced to its barest minimum in Nigeria”. Uba further commended the officers/men who have put their lives on the line making these seizures; most especially the over 58 trailers load of rice knowing full well it’s a big battle at the creek.